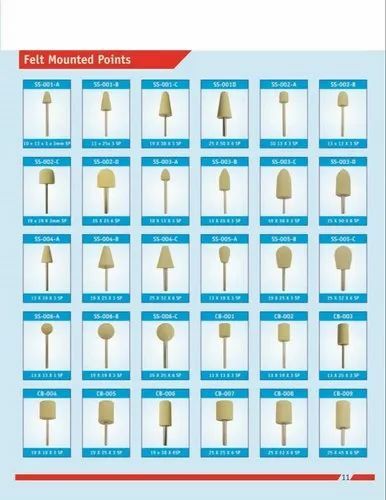 Felt mounted points made from highest quality of cotton felt for SS / MS polishing buffing. Since our birth in the year 2014, we, Cosmos Abrasives, are providing a complete abrasive product range as an Authorized Distributor for Grindwell Norton, wholesaler, exporter and trader. We have carved a mark of perfection and excellence in the market by offering the finest range of Grinding Wheels, Cutting Wheels, Abrasive Belts, Hacksaw Blades, Gold Plus Discs, Sanding Discs, Velcro Disc, Bandsaw Blades, Waterproof Paper, Abrasive Papers, Diamond Wheel Dresser, Diamond Polishing Paste, Emery Papers and many more. We are consistently bringing forth highly advance and innovative products which are in line with the diverse requirements of the clients. Our recruited procurement team does not hesitate in going the extra mile in order to retain the outstanding quality of our offered product range. We have updated infrastructure with modern facilities for carrying our trouble free business activities. Our company is working round the clock with the objective of gaining and maximizing clients’ satisfaction. Besides, our simple payment options, market leading rates and customer based approaches have enabled us to attain tremendous success in a short time period.